Mornings and Epilogues: Who Am I? The Get To Know Me Tag! Who Am I? 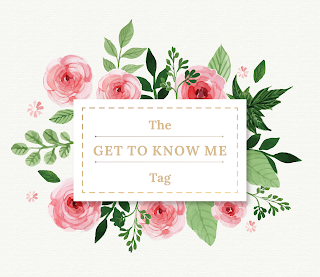 The Get To Know Me Tag! Occupation: None yet, I'm still in high school! Hair length: Medium length. It's past my shoulders, but not so long. Piercings: None, but am unsure about getting any at all. Tattoos: They look pretty cool, but I probably won't be getting any tattoos ever. Best friend: My first best friend was a girl called Franka. We spent most of primary school together, but we're not that close anymore. Real holiday: I went to Tokyo, Japan with my parents, and it was so fun! I remember being so lost though, because everything was in Japanese and not many people knew English at the time. Colour: Blue, but not like neon blue. More like a deeper blue. Shoes: I like sandals and flats. I try to avoid wearing socks as much as I can. Thinking about: Which book to read next: something that's been on my TBR for years, or something I just saw? Watching: Trying to catch up with Supernatural. 11 seasons and counting? A lot of work! Children: Currently, I feel that I probably won't have children. Not until I'm 200% sure and I'm physically and mentally capable of raising another human being. Marriage: Sure, why not? Not now, of course. But I think I'll marry the person I really love. Careers: I'm thinking of becoming a doctor. That's currently number one. If not, I'd like to study biochemistry. Sounds cool, right? Where to live: Somewhere quiet, but not too quiet. So, I guess on the outskirts of a city? Yeah, that would do. God: No, not God. But I do believe that there's something after death. Miracles: Yeah, these exist. But they come rarely and only if you deserve it. Love at first sight: No, I don't. I mean sure, attraction at first sight exists, but not love. At least, not for me. Ghosts: Yes. My reasoning is, even if you have no scientific evidence of them existing, you don't have evidence of them not existing, so there. Aliens: Why not? We can't be the only people in the vast, expanding universe, right? No way are we alone. There has to be someone out there. Soul mates: Yeah, soul mates exist. I believe that we all eventually find them, but we may not realise it. Heaven/hell: No heaven, no hell. Kissing on a first date: Sure, if you really like the person. I don't see why not. Yourself: Sometimes? I find myself second guessing myself at times though. Don't follow my example kids, always believe in yourself! And anyone who wants to join in! It was nice getting to know you a little better. I'm about like you. I'm in my 20s and I still don't know if I'd be capable of taking care of another human being, lol. Kudos on wanting to become a doctor! I'm far too squeamish for that sort of thing, but I definitely respect people who can. I ended up studying archaeology instead, where things have been dead a long time and I don't have to worry about bodily fluids, lolol. Page One! Such a great place. I always make a trip there whenever I visit Hong Kong. Unfortunately, the one I normally went to closed...sigh. Haha, blue is like the best colour! Tokyo is amazing, Japan is awesome! Language barriers are so frustrating, no? Oh January child hi five! ;D And omg you listed Suzanne Collins and VE Schwab...YOU CLEARLY ARE AN AMAZING BOOKWORM WITH AMAZING TASTE! *shrieks* I'm pretty sure I'd never be capable of looking after another human for the whole time. xD I babysit a lot and omg, I'm always soooo relieved when my nephew/nieces go home. HA. Ahem.